Poured a black body with minimal head and little lace. The aroma is coffee but it's a mild coffee, not over powering, and doesn't hide some minimal chocolate notes. The beer is medium-bodied, has a mild coffee taste that is almost like coffee with creamer (getting this weird quasi-lactic feel), and there's a touch of chocolate in the background. Pleasant, easy drinking porter that hits multiple notes and I like the hidden ABV. 500 ml bottle into a tulip snifter. Had 6/26/18. Pours near black, opaque, with a two inch creamy head with good retention and lots of foamy lacing. Really looks good. Aromas of coffee, roasted malt, chocolate, cocoa, some vanilla and toffee, light licorice. Smells a little herbal. The taste is pretty similar- malt, coffee, chocolate, some caramel, light vanilla and licorice, a little toffee. More of an herbal flavor than there was aroma, slightly bitter on the finish. Very smooth, somewhat creamy, a solid full body, well carbonated. Thought this was a high level example of the style, very well done. 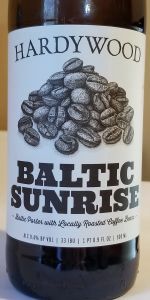 It’s coffee prevalent but not dominant, has a great feel, and has some Euro Stout- like notes to reinforce that it’s a Baltic. Well worth a purchase and glad I have one left. A: Dark black in color with a rich tan head. S: Big coffee notes.. almost like kahlua and cream... A dash of vanilla, and some dark bread. T: Rich malty bread with dark malt, molasses, and caramel. Coffee takes a bit of a backseat, but it is there in the finish smooth, and rich. M: Medium thick with a creaminess I rather enjoy. Moderate carbonation. O: Overall, dark, roasty, and coffee goodness, what's not to like? A - Black pour with thin caramel lacing. S - Roasted chocolate char, some delicate smoke, light notes of coffee bean. T - Chocolate roasted malt, coffee bean, slight earthiness, and ends with a moderate coffee bean bitterness. Lingering dark chocolate bitterness on the back of the palate. M - Chewy and full bodied with a bone dry finish on the top of the tongue. O - For a 9.1% Baltic Porter, the ABV is well hidden here. The chocolate and coffee drive this beer. The current score is 3.88 (which is Very Good) prior to this rating. Despite my opinion, it's definitely worth checking out. I have to say again, I'm surprised how well the ABV is hidden. Nice job, Hardywood. The beer streams from the bottle a clear dark brown, though once in the glass, it seems a bit darker. But, as is often the case, perhaps a truer color (auburn in this case) ca be seen at the edges still. The mocha tan head is fairly creamy, keeps a creamy if thin cap (though without a nucleated glass, I think I'd have just a thick collar). Not much lacing. Smells like a mix of cola, roasted malt, and coffee. There's a very slight grain husk or woody accent that seems a tad weird in some whiffs. I might be anticipating a slightly bitter-leaning roasty beer with the coffee perhaps boosting the bitter side a tad based on the nose. Taste actually does hit with a little more malt sweetness up front than the nose led me to believe. Then a bakers chocolate and cola swirl washes that away to bring the coffee/roasted flavor and bitterness I was originally expecting. Fairly smooth, it does have a lightness to it (maybe not quite medium) with a soft, prickly carbonation. In judging this, I noticed a little tang as the beer sat on my tongue that might be from the coffee or yeast although it's not unlike a flavor I get from barrels at times - and maybe that explains that part of the nose. Quite enjoyable, and as it warmed, I did start noticing a dark-skinned nutty aspect in back (again, maybe from the coffee). Not a typical beer for the style, but the coffee addition was bound to affect the beer in some fashion. In this case I think it hybridizes the beer slightly towards a regular stout/porter. Pours a dark brown with a several fingers thick, light brown, fluffy head. Strong coffee scent with some lighter notes of roast and dark fruits. Taste is sharp, strongly coffee flavored up front, melds into a little roast, light chocolate, floral and leather notes. Alcohol note at the finish. Medium body, creamy feel. Solid, but certainly could use some tuning to maybe tone down the coffee a bit and allow the other flavors a chance to shine. Dark brown with a moderately sized, fluffy cream-tan head. An acidic, almost metallic nose consists of of medium roast coffee and mildly roasty malt. Taste is tangy, sharp and semi-bitter with coffee and a slightly astringent presence that is possibly due to some hops. A finely stinging roast brings some chocolate, as it finishes with some kind of hint of vanilla-esque soft banana skin. The bitterness here wins out, though, and it's almost woody. The moderate-light body has a soft, crisp, semi-filling fizz and finishes semi-dry. Poured from the bottle into a snifter style glass. Creamy topped head, off tan to a faint khaki brown color, and reaching a solid two plus fingers in height. Very dark body, nearly black with a faint red tinge and not a spec of other color getting through at all. Rich coffee notes on the aroma. Soft mixing coffee and dark like cocao nibs, and sweet roasting tones. Touches of fruity yeast and estery quality but gets taken over by the coffee, does perhaps flirt with a bit of strawberry, but more dark rich character dominates the beer's nose. Crackling body surprisingly and different coffee flavors than expected. Light bodied, but with a touch of creamy feel and flavor, but just by a hair. Mild sensing roast, with more drip coffee quality on the palate. Strong black licrorices aftertaste as well, flirting with a sticky sweetness that gives a good rooftop tongue sticky feeling. Strangely has much brown ale character, but bigger, lots of nutty rich qualities. Pretty solid coffee porter, a few interesting unexpected twists, but also doesn’t come across as that much baltic, but no complaints.